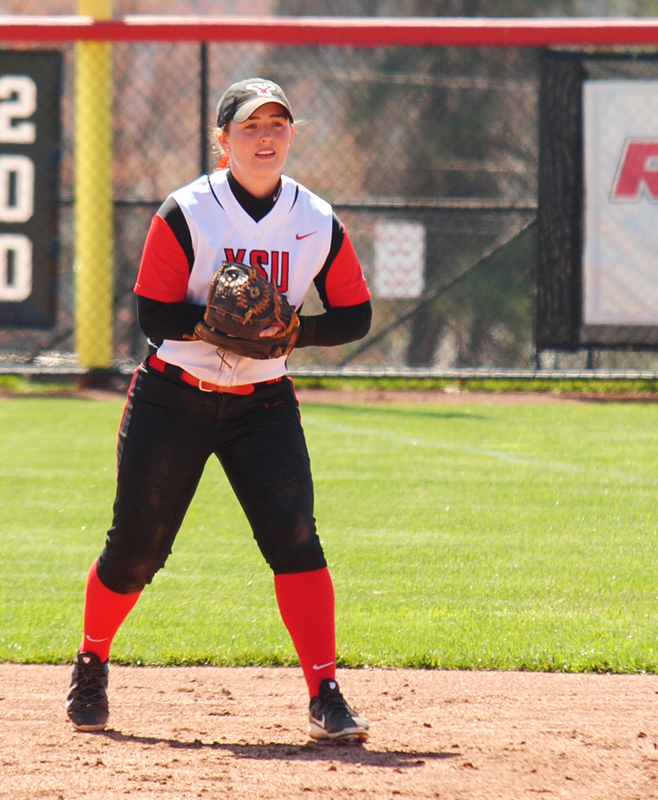 Brittney Moffatt, Youngstown State University’s second baseman, gets into position prior to a pitch during a YSU home game last season. Following a 30-21 season in 2016, the Youngstown State University is preparing for the 2017 season opener. 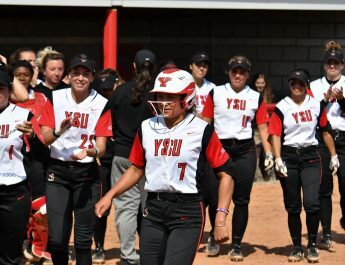 The Penguins finished with one of the best seasons in program history last year, but YSU’s goal is to make it farther in the Horizon League tournament. Cali Mikovich and Sarah Dowd were considered one of the most powerful tandems in the league. Mikovich and Dowd combined to hit 24 homeruns and drive in 76 RBIs. The Penguins lost infielder Miranda Castiglione, YSU’s stolen base leader and one of the most decorated players in program history. This season, the Penguins roster is filled with underclassmen who contributed significantly throughout the year. Dowd said the familiarity between all of the teammates will help the team this season. She said it’s easier to win after playing with teammates for two or three seasons. YSU will play Towson University, Coastal Carolina University and the University of Alabama in the first three games of the year. Campbell said the Penguins’ offense will be the most concerning since YSU can’t practice on the field during the winter. “We understand that when we head down there this weekend, that Alabama has been on their field all spring — same thing with Coastal [Carolina],” Campbell said. “Townson might be in the same boat as us with them being a northern team. The Penguins also have both full-time pitchers returning this season. Senior Caitlyn Minney and sophomore Paige Geanangel combined to win all 30 games last season. Geanangel led the Penguins with a 17-12 record and pitched 13 complete games. Geanangel’s 17 wins ranked third in school history for single-season wins, and Minney’s 13 wins ranked 10th on the list. The Penguins will start the season on the road for the first month of the season. The Penguins won’t play a home game until they host the University of Akron on March 12.